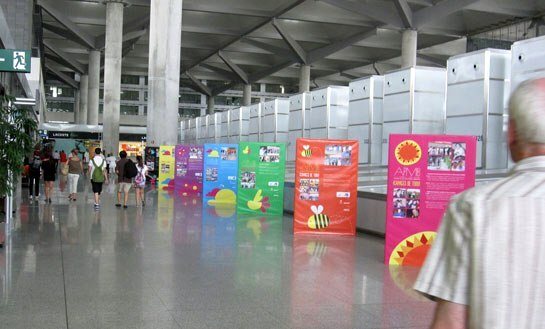 Malaga Airport hosts from today a photo exhibition entitled “Capable of everything” collecting the graphic memory of two decades of physical activity of members of the Iberia Employees Association of Parents of Disabled (APMIB). The exhibition, which takes place in the boarding area of T3, shows the sports experience for the past 20 years of the members of this group, which has workplaces in different airports of the network. The images invite to ‘travel’ along sporting competitions, training, programs and tournaments featuring the past two decades of some athletes with functional diversity and talk about normality, the effort and the overcoming of any athlete, without regard to barriers or restrictions. The initiative, which began in Madrid-Barajas Airport, will stay in Malaga T3 until September 15 and will continue in other Spanish airports such as Barcelona-El Prat, Las Palmas, Los Rodeos (Tenerife) or Palma de Mallorca. Iberia Employees Association of Parents of Disabled was founded in 1977 by a group of workers from Iberia, parents of disabled, to assist in the social and labour integration of disabled people. Currently, this organization serves 2,500 people with functional diversity through comprehensive care by the creation of productive employment and various services. The collective APMIB develops its work in different airports of the network and has in Malaga an agreement for waste management of the airport grounds.